Here’s another story for the file on strange ocean occurrences this year. A dead oarfish, estimated at 24 feet long when it was alive, washed up on Catalina Island. The oarfish is the second of the deep-sea creatures to wash up dead at a beach on the Southern California island this year, adding further to the amount of unusual marine life behavior this summer likely due to the warmer El Nino effect. As to the oarfish, biologists are not quite sure what brought it to the surface with theories ranging from seismic activity to ocean warming. 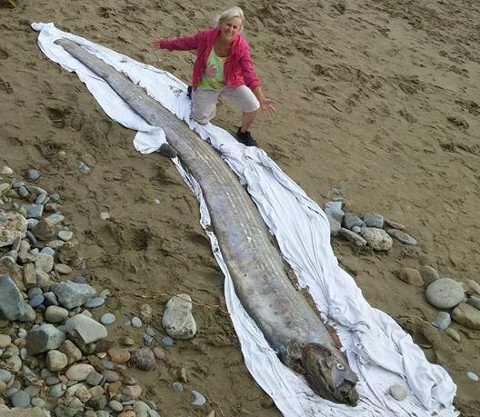 Someone found the 15 1/2 foot serpent on a beach near Avalon with its tail severed. Marine biologists say the fish does this to shed weight when it’s in distress or sick. Annie MacAulay of the Mountain and Sea Educational Adventures dissected the serpent to try and discover what happened. In an interview with LiveOutdoors, MacAulay said it’s important to understand why the oarfish died because it can tell us something about the environment. As a marine biologist on Catalina Island for 50 year, MacAulay said she’s never found an oarfish until the last two years. MacAulay estimates the sea creature, which was likely the source of mythic sea monsters, at 24 feet long and weighing 150 to 200 pounds when it was alive. Oarfish are rumored to grow in excess of 50 feet long, but not much is known about the species. A doctor she spoke with recently suggested they try radiation on the specimen she has now. In Japan, they believe when oarfish come to the surface it’s a sign of an impending earthquake. With the movie San Andreas coming to theaters soon, who knows. Unbelievable! The second oarfish that we found washed up on the shores of Catalina Island.